IPv6 technology The DGS-3120 Series supports both IPv4 and IPv6 protocols to meet the ever-increasing demand of larger address space. IPv6 simplifies, streamlines network configuration and also reduces costs of deployment. These switches have been certified with IPv6 ready logo phase 2 from the IPv6 forum, a worldwide IPv6 advocacy consortium. The IPv6 ready logo program provides conformance and interoperability of IPv6 products. MLD snooping enhances efficiency in selective distribution by forwarding multicast data to ports that receive data, rather than flooding all ports in a VLAN. Features such as QoS, ACL (based on IPv6 flow label and traffic class), provide a faster and more efficient service. D-Link Green technology D-Link is striving to take the lead in developing innovative and power-saving technology that does not sacrifice operational performance or functionality. The DGS-3120 Series implements the D-Link Green technology, which includes a power saving mode, smart fan, reduced heat dissipation, and cable length detection. The power saving feature automatically powers down ports that have no link or link partner. The Smart Fan feature allows for the built-in fans to automatically turn on at a certain temperature, providing continuous, reliable and eco-friendly operation of the switch. Resilience/performance enhancement The DGS-3120 Series offers superior performance and enhanced network resilience, through the latest 802.1D-2004 RSTP and 802.1Q-2005 MSTP spanning tree protocols. STP allows you to configure the switch with a redundant backup bridge path, so transmission and reception of packets can be guaranteed in event of any fail-over switch on the network. 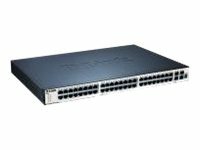 802.3ad Link Aggregation provides aggregated bandwidth between switches or servers to increase redundancy for higher availability. 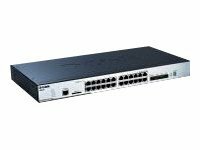 The switches support 802.1p for Quality of Service (QoS). This standard is a mechanism that classifies realtime traffic into 8 priority levels mapped to 8 queues. Packet classification is based on TOS, DSCP, MAC, IPv4, VLAN ID, TCP/UDP port number, protocol type and user defined packet content, which enables flexible configuration especially for real-time streaming multimedia applications such as Voice over IP (VoIP). The switches also provide a Safeguard Engine for network protection to increase reliability, serviceability and availability. The switches support 802.1p for Quality of Service (QoS). Traffic control Network administrators can define throughput levels for each port to allocate its essential bandwidth. Broadcast storm control and flow-based bandwidth control can reduce the level of damage from virus attacks or P2P applications to the network. Manageability D-Link's Single IP Management (SIM) simplifies and speeds up management tasks, allowing multiple switches to be configured, monitored and maintained from any workstation running a web browser through one unique IP address. This virtual stack is managed as a single object, having all units maintained by one IP address. The DGS-3120 Series also supports standard-based management protocols such as SNMP, RMON, Telnet, Console, Web-based GUI and SSH/SSL security authentication. Standard and enhanced images The DGS-3120 Series is embedded with two different software images - Standard Image (SI) and Enhanced Image (EI). The Standard Image provides sophisticated features for businesses. It includes advanced Quality of Service (QoS), traffic shaping, L2 multicasting and robust security features. The Enhanced Image supports ERPS, Double VLAN (Q-in-Q), Ethernet OAM, Static Route, IMPB, sFlow, IPv6 features which are suitable for the next generation IPv6 networks or triple play applications in Metro Ethernet. Enhanced network reliability The DGS-3120 Series targets businesses and customers who require a high level of network security and maximum uptime. All the models in DGS-3120 Series support an external redundant power supply so that continued operation can be assured. Comprehensive security The DGS-3120 Series provides users with the latest security features such as Multilayer and Packet Content Access Control Lists (ACL), Storm Control, and IP-MAC-Port Binding (IMPB) with DHCP Snooping. The IP-MAC-Port Binding feature allows administrators to bind a source IP address with an associated MAC and also define the port number to enhance user access control. With the DHCP Snooping feature, the switch automatically learns IP/MAC pairs by snooping DHCP packets and saving them to the IMPB white list. In addition, the D-Link Safeguard Engine identifies and prioritizes "CPU interested" packets to prevent malicious traffic from interrupting normal network flows, and to protect switch operation. Identity driven network policies The DGS-3120 Series supports authentication mechanisms such as 802.1x, Web-based Access Control (WAC), and MAC-based Access Control (MAC) for strict access control and easy deployment. After authentication, individual policies such as VLAN membership, QoS policies, and ACL rules can be assigned to each host. In addition, the switch also supports Microsoft NAP (Network Access Protection). NAP is a policy enforcement technology that allows customers to protect network assets from unhealthy computers by enforcing compliance with network health policies. Traffic management for triple play The DGS-3120 Series implements a rich set of multilayer QOS/CoS features to ensure that critical network services like VoIP, video conference, IPTV and IP Surveillance are served with high priority. The Traffic Shaping features guarantee bandwidth of these services when the network is busy. With L2 Multicast support, the DGS-3120 Series shows its ability to handle growing IPTV applications. Host-based IGMP/MLD Snooping allows multiple multicast subscribers per physical interface and ISM VLAN sends multicast streams in a multicast VLAN to save bandwidth and to provide better security to the backbone network. The ISM VLAN profiles allow system administrators to bind/replace the pre-defined multicast registration information to subscriber ports quickly and easily. Proactive, effective network management To uphold business customers' Service Level Agreements (SLA), service providers must reduce the Mean Time to Repair (MTTR) and increase service availability. Ethernet OAM features address these challenges and enable service providers to offer carrier-grade services. The DGS-3120 Series supports industry-standard OAM tools, including IEEE 802.3ah, IEEE802.1ag, and ITU-TY.1731. Connectivity Fault Management (CFM) provides tools to monitor and troubleshoot end-to-end Ethernet networks, allowing service providers to check connectivity, isolate network issues, and identify customers affected by network issues. IPv6 technology The DGS-3120 Series is fully compliant with the future IPv6 networks. It supports remote IPv6 manageability from telnet, HTTP, or SNMP. To create secure IPv6 networks, the DGS-3120 Series uses IPv6 ACL, DHCPv6 Snooping and Neighbor Discovery (ND) Snooping functions to protect the network from illegal IPv6 clients. The DGS-3120 Series has been certified with IPv6 Ready Logo Phase 2 from the IPv6 forum, a worldwide IPv6 advocacy consortium. The IPv6 Ready Logo Program provides conformance and interoperability of IPv6 products. Manageability D-Link's Single IP Management (SIM) simplifies and speeds up management tasks, allowing multiple switches to be configured from any workstation running a web browser through one unique IP address. This virtual stack is managed as a single object, having all units maintained by one IP address. The DGS-3120 Series also supports standard-based management protocols such as SNMP, RMON, Telnet, Console, Web-based GUI and SSH/SSL security authentication. D-Link Green Technology D-Link is striving to take the lead in developing innovative and power-saving technology that does not sacrifice functionality. The DGS-3120 Series implements the D-Link Green Technology, which includes a power saving mode, smart fan, reduced heat dissipation, and cable length detection. The power saving feature automatically powers down ports that have no link or link partner. The Smart Fan feature allows for the built-in fans to automatically turn on at a certain temperature, providing continuous, reliable and eco-friendly operation of the switch. Standard and Enhanced Images The DGS-3120 Series is embedded with two different software images - Standard Image (SI) and Enhanced Image (EI). The Standard Image provides sophisticated features for campus, or enterprise. It includes advanced Quality of Service (QoS), traffic shaping, L2 multicasting, and robust security features. The Enhanced Image supports ERPS, Double VLAN (Q-in-Q), Ethernet OAM, Static Route, IMPB, sFlow, IPv6 features which are suitable for the next generation IPv6 networks or triple play applications in Metro Ethernet. 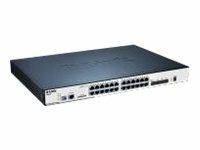 Enhanced Network Reliability The DGS-3120 Series targets enterprise/campus and customers who require a high level of network security and maximum uptime. All the models in DGS-3120 series support an external redundant power supply so that continued operation can be assured. They also include other features, such as 802.1D Spanning Tree (STP), 802.1w Rapid Spanning Tree (RSTP) and 802.1s Multiple Spanning Tree (MSTP), Loopback Detection (LBD), and Broadcast Storm Control, that enhance network resilience. 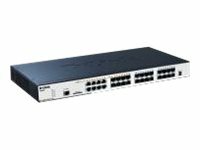 The G.8032 Ethernet Ring Protection Switching (ERPS) function minimizes the recovery time to 50 ms. For load sharing and redundancy backup in switch cascading/server attachment configuration, the DGS-3120 Series provides dynamic 802.3ad Link Aggregation Port Trunking. Comprehensive Security The DGS-3120 Series provides users with the latest security features such as Multi-layer and Packet Content Access Control Lists (ACL), Storm Control, and IP-MAC-Port Binding (IMPB) with DHCP Snooping. The IP-MAC-Port Binding feature allows administrators to bind a source IP address with an associated MAC and also define the port number to enhance user access control. With the DHCP Snooping feature, the switch automatically learns IP/MAC pairs by snooping DHCP packets and saving them to the IMPB white list. In addition, the D-Link Safeguard Engine identifies and prioritizes "CPU interested" packets to prevent malicious traffic from interrupting normal network flows, and to protect switch operation. Traffic Management for Triple Play The DGS-3120 Series implements a rich set of multilayer QoS/CoS features to ensure that critical network services like VoIP, video conference, IPTV and IP surveillance are served with high priority. The Traffic Shaping features guarantee bandwidth of these services when the network is busy. With L2 Multicast support, the DGS-3120 shows its ability to handle growing IPTV applications. Host-based IGMP/MLD Snooping allows multiple multicast subscribers per physical interface and ISM VLAN sends multicast streams in a multicast VLAN to save bandwidth and to provide better security to the backbone network. The ISM VLAN profiles allow users to bind/replace the pre-defined multicast registration information to subscriber ports quickly and easily. Proactive, Effective Network Management To uphold enterprise customers' Service Level Agreements (SLA), service providers must reduce the Mean Time to Repair (MTTR) and increase service availability. Ethernet OAM features address these challenges and enable service providers to offer carrier-grade services. The DGS-3120 Series supports industry-standard OAM tools, including IEEE 802.3ah, IEEE802.1ag, and ITU-T Y.1731. Connectivity Fault Management (CFM) provides tools to monitor and troubleshoot end-to-end Ethernet networks, allowing service providers to check connectivity, isolate network issues, and identify customers affected by network issues. Unparalleled flexibility Easily deployed and simple to manage, the DGS-3420 can be stacked with any switch that supports D-Link's Single IP Management to form a multi-level network structured with backbone and centralized high-speed servers. The virtual stack can include units located anywhere on the same network domain, and uses optional 10-Gigabit uplinks to move intra-stack traffic at 20 Gbps full duplex speeds. Redundant ring stacking Alternatively, depending on whether linear or fault tolerant ring stacking is implemented, users can use one or two 10-Gigabit SFP+ ports to create a physical stack. 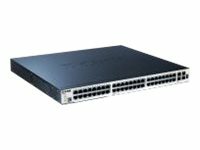 12 units or 576 Gigabit ports can be configured for a stack using direct attach cables to provide high-bandwidth on the DGS-3420 series with cost efficiency. Security, performance and availability The DGS-3420 series provides a complete set of security features including L2/L3/L4 multi-layer Access Control Lists and 802.1x user authentication via TACACS+ and RADIUS servers. The DGS-3420 series offers extensive VLAN support including GVRP and 802.1Q VLAN to enhance security and performance. A robust set of L2/L3/L4 QoS/CoS solutions help ensure that critical network services such as VoIP, ERP, Intranet, and video conferencing are served with proper priority. The series also provides D-Link's Safeguard Engine to increase the switch's reliability, serviceability, and availability to prevent malicious flooding traffic caused by worms or virus infections. IPv6 technology The DGS-3420 series also features comprehensive IPv6 support, including IPv6 tunnel, ICMPv6, DHCPv6, RIPng, and more. With 10-Gigabit connectivity and IPv6 support, the series enables you to future-proof your network for cost efficiency and longevity while meeting the requirements that future IPv6 capable network devices require. D-Link Green technology D-Link is striving to take the lead in developing innovative and power-saving technology that does not sacrifice operational performance or functionality. The DGS-3420 series implements D-Link Green technology, which includes a power saving feature, smart fan design, reduced heat dissipation, and cable length detection. The power saving feature automatically powers down ports that have no link or link partner. The smart fan design allows the built-in fans to automatically turn on only at a certain temperature, providing continuous, reliable and eco-friendly operation of the switch. 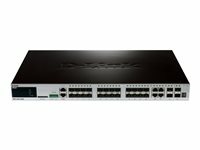 Unparalleled flexibility Easily deployed and simple to manage, the DGS-3420 can be stacked with any switch that supports D-Link's single IP management to form a multi-level network structured with backbone and centralized high-speed servers. The virtual stack can include units located anywhere on the same network domain, and uses 10-Gigabit uplinks to move intra-stack traffic at 20 Gbps full duplex speeds. Security, performance and availability The DGS-3420 series provides a complete set of security features including L2/L3/L4 multi-layer Access Control Lists and 802.1x user authentication via TACACS+ and RADIUS servers. The DGS-3420 series offers extensive VLAN support including GVRP and 802.1Q VLAN to enhance security and performance. D-Link Green technology The DGS-3420 series implements D-Link Green technology, which includes a power saving feature, smart fan design, reduced heat dissipation, and cable length detection. The power saving feature automatically powers down ports that have no link or link partner. The smart fan design allows the built-in fans to automatically turn on only at a certain temperature, providing continuous, reliable and eco-friendly operation of the switch. 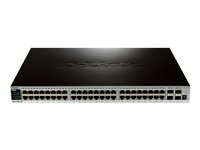 Unparalleled flexibility Easily deployed and simple to manage, the DGS-3420 can be stacked with any switch that supports D-Link's single IP management to form a multi-level network structured with backbone and centralized high-speed servers. Redundant ring stacking Alternatively, depending on whether linear or fault tolerant ring stacking is implemented, users can use one or two 10-Gigabit SFP+ ports to create a physical stack. D-Link Green technology D-Link is striving to take the lead in developing innovative and power-saving technology that does not sacrifice operational performance or functionality. The DGS-3420 series implements D-Link Green technology, which includes power saving through link status, smart fan design, increased heat dissipation, and cable length detection.